إن فندق بيبرز إيرلي بيتش بموقعه الممتاز في هذه المنطقة السياحية هو نقطة انطلاق جيدة لنزهاتك في هذه المدينة المذهلة. إن موقع الفندق الاستراتيجي، الذي يبعد فقط عن مركز المدينة، يسمح للنزلاء بالوصول سريعاً وبسهولة إلى العديد من الوجهات المحلية المثيرة. يقع هذا الفندق الحديث على مسافة قريبة من المعالم السياحية الشهيرة. إن بيبرز إيرلي بيتش حريص على توفير الراحة للنزلاء، فلا يوفر الموظفون جهداً في تقديم أفضل الخدمات وضمان حسن الاستقبال. يمكن لضيوف الفندق الاستمتاع بالميزات التالية على أرض الفندق: مرافق مخصصة لذوي الاحتياجات الخاصة, تسجيل وصول/خروج سريع, تخزين الأمتعة, واي فاي في المناطق العامة, صف السيارات. تعكس غرف الفندق البالغ عددها المنتشرة في 3 طوابق جواً من الدفء والألفة.خدمات عصرية مثل تلفزيون بشاشة مسطحة, حمام إضافي, مرحاض إضافي, بياضات, مرآة موجودة في بعض الغرف المختارة. إن حوض استحمام ساخن, مركز للياقة البدنية, حمام سباحة خارجي, سبا, حديقة هو المكان الأمثل في الفندق للاسترخاء وتفريغ طاقتك بعد نهار طويل. يشكل بيبرز إيرلي بيتش بخدماته الراقية وموقعه الممتاز، قاعدة مثالية للاستمتاع بإقامتك في المدينة. وعلى النزلاء الذين يصلون في غير الأوقات المذكورة الاتصال بالعقار مباشرةً قبل الوصول بيوم حتى يتم إعداد الترتيبات البديلة. يتم تقديم الفطور من 6:30 AM إلى 10:30 AM. يقدم الغداء من الساعة 12:00 ظهرًا إلى 5:00 مساءً. يقدم العشاء من 5:30 PM إلى 9:00 PM. Daily breakfast was good! First day I saw a cockroach in my apartment. I’m not sure that’s normal or not too clean? Even the weather was tropical season but still happy. 😉 Nice staffs! From the resort walk to Woolworths Airlie Beach about 12 minutes. Even u took the taxi about 7 dollars. Still very close to the town. Recommend it!! My sister & I would like to extend a massive Thanks to Aotea, Jodi, Sue, Lee, Barry, Maggie, Chef & The rest of the team at PeppersAirlieBeach. For accomodating, supporting, consoling lending phones & just being wonderful to us during the Tropical Cyclone Debbie crisis. The level of hospitality from Peppers is simply outstanding and just what we needed during an unfortunate circumstance. Cyclone crisis aside, on a business-as-usual day, breakfast buffet was fresh and delicious, staff were always friendly n helpful as well as amazing cocktail promos! We were booked on to a week bare-boating in the Whitsundays. 7 of us hired a three-bedroom unit at Peppers for the first night to acclimatise and relax for the holiday. Peppers was perfect way to do this. I stayed here 3 night. Everything is nice, fantastic. Except one thing. First day, I told to reception staff. "my living room's main light work out" He told "Ok. we will fix it tonight or next morning" But during our stay. light always work out. The resort is about 3 mins drive from the Port of Airlie and about 10mins walk but up hill. The views are amazing and staff were all nice. We booked a 2 bedroom spa room for 5 of us girls and there was plenty of space. The resort is about 15 mins walk into the main town. The resort does have shuttles that come every few hours to take you into town but if you miss that then a taxi ride would be about $7-$8. Overall our stay was fantastic and definitely recommend to others. Was overall a great stay although I found a couple of small issues - the bed was probably the most uncomfortable I had ever slept in and was hard as a rock. I found the noise coming from the upstairs apartment excessive with furniture being dragged and banging early in the morning making a sleep in impossible. Their was also a smell coming from the drains that was offensive. The room was beautiful and faculties great though it could of been a bit cleaner. All this being said I would stay again if it was a different bed! we got there at night and tired. once you get to the room. it took our breath away! the view was superb. we quickly cooked dinner for the family and eat at the balcony. love the layout of the apartment. you need a car for this apartment. there was a problem with the wifi but everything else was great. we didnt know check out time in australia was 10am so that was a bummer. satisfied its a quality luxury resort, taxi's are available 24/7, easy access to pub, club and restaurant. Room has a fantastic view, overall its a great location, buses from the whitsunday tour are available. We found the staff helpful and friendly. The setting is amazing, with gorgeous views. The kids especially enjoyed the pool while we relaxed and enjoyed the view of the ocean. Good for kids and we would stay there again for sure. 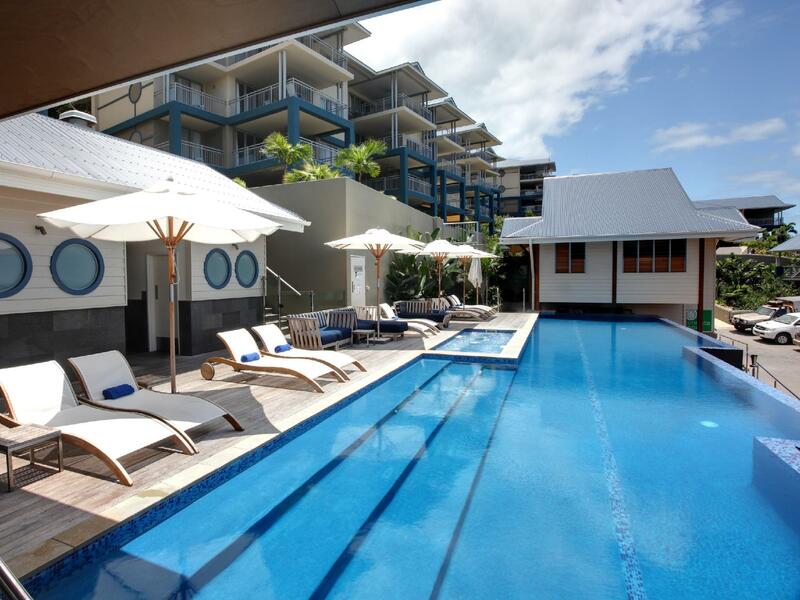 peppers is a great modern resort with good views out on the whitsunday islands. reception was extremely helpfull with anything we needed. the apartment was spacious with folding doors opening onto the balcony that was nice to sit and take in the views. rooms were fully air conditioned which helped with the tropical nights. peppers was only a short walk to the centre of airlie for shopping and resturants. the resort horizon pool was awsome to cool off in while sipping a cocktail from the bar! The Peppers is located just outside of town. It is a 10 minute walk, or you can take the shuttle bus which runs every 2 hours. The rooms were big and spacious. The pool was really small for a resort of this size, but we used the lagoon pool in the town so it didn't bother us. We ate in the restaurant one night which I would recommend. We had a lovely night in a one bedroom apartment on Saturday night. The room was very moder, spacious and comfortable. The bath was amazing and the shower pressure was good too. The bed was comfortable and restful. The views are of course amazing and we got to enjoy them more over an lovely a la carte breakfast before sadly checking out. The staff were great and our only complaint is that we couldn't stay longer. The rooms were modern, comfortable and service was good too. A great hotel with great amenities. Only draw back is it is on a VERY steep hill so not the best for walking back to, they do a shuttle bus though and taxi's aren't too expensive from the main street. Under cover parking is available and the baths are massive! Good trip with beautiful food and view. This place was fantastic! Was a bit further from the centre of town and up a steep hill but the shuttle bus and buggy pick up made this no real issue. The free breakfast was amazing!! Everything was great, except that the shuttle bus only operates every two hours and before 7pm.